Glass also plays an important role in the fire rated areas. 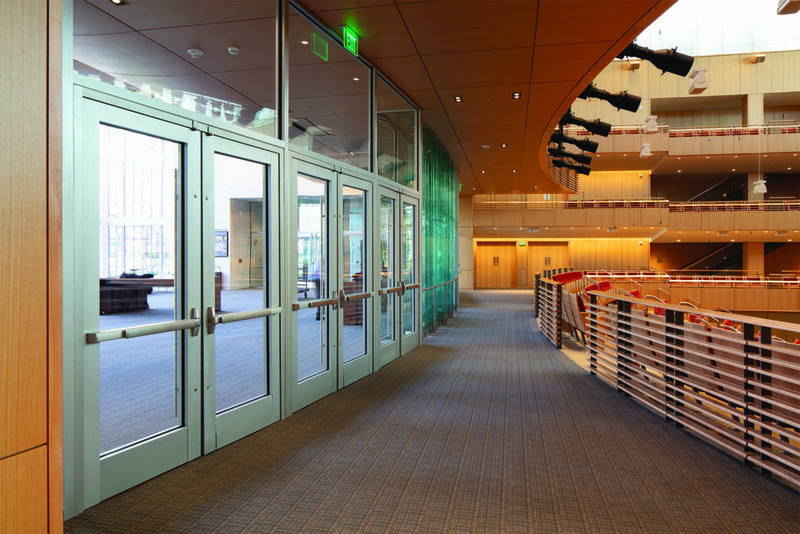 To maximize transparency, SAFTI FIRST met with the architects during the design phase to create a large, 2-hour, glass wall that separates the lobby from the auditorium while providing a visual connection between the auditorium and the lobby. Since this 2-hour glass wall also serves as the entrance to the auditorium, deciding on a 90-minute door system was of upmost important. SAFTI FIRST’s in-house engineering department provided design assistance, system details, engineering calculations and support from the planning phase all the way to the submittal process. 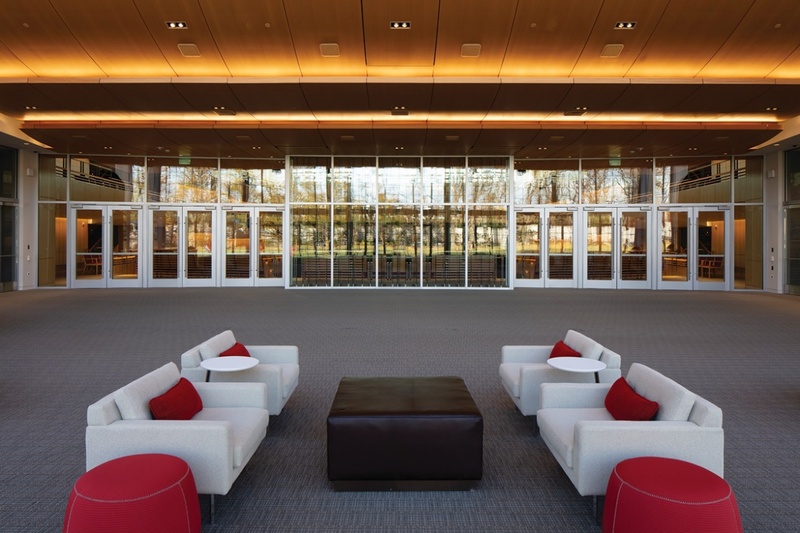 The architects took full advantage of SAFTI FIRST’s large glass sizes by designing a segmented, arched wall system that used SuperLite II-XL 120’s maximum sizes (up to 4,879 sq. in.). The GPX Curtain Wall framing’s slim, 2-1/2” profile with equal sightlines and clean edges mimicked the look of aluminum storefront, which the architects liked. Using Starphire Low-iron glazing also gave the system a visual light transmission of 89.5% – the highest of any 2-hour fire resistive glazing product available today. 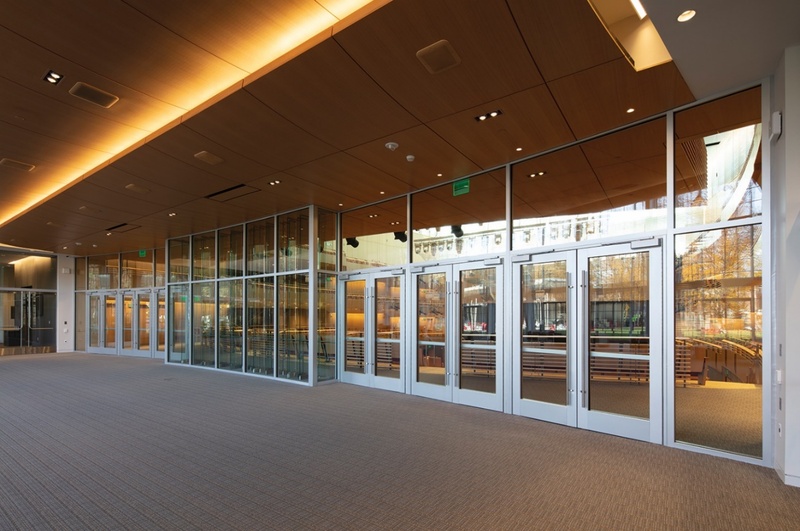 To ensure that the auditorium will be able to exit all 1,000 seats in a timely manner, the architects specified 6 pairs of 3’ x 8’ 90-minute, temperature rise aluminum doors. To exceed 100 sq. inches in the vision panels of these doors, SAFTI FIRST supplied ASTM E-119 rated SuperLite II-XL 90 with Starphire Low-iron glass for the door vision panels. The architects chose the GPX Architectural Series Doors because it is the only temperature rise aluminum door system that can accommodate concealed vertical rods, which is was an important design requirement. The doors were supplied with a panic device to facilitate quick and safe egress in the event of an emergency.